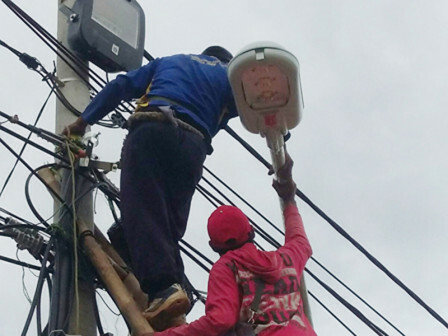 Several areas in five sub-districts in West Jakarta have been installed with 1,962 LED SS type of streetlamps until August 28, 2018. "We start to replace 1,962 streetlamps since August 2, from HPS into LED SS"
West Jakarta Industry and Energy Sub-dept Head, Ery Ghazali stated, 583 streetlamps have been installed in Tambora Sub-district, 583 streetlamps in Tamansari, 708 streetlamps in Palmerah, 49 streetlamps in Grogol Petamburan and 30 streetlamps in Kembangan Sub-district. "We start to replace 1,962 streetlamps since August 2, from HPS into LED SS," he stated, Monday (9/3). He added, his side plans to install 18,033 LED lamps in eight sub-districts until the end of this year. "The one who handle LED lamp procurement is Jakarta Industry and Energy Dept.," he conveyed.